Resting on a gentle slope in Spain, the Bielmann House by Rob Dubois is a monolithic masterpiece. The family dwelling is made from a folded slab of concrete. Large overhangs shade the interior during the summer months while creating shelter for outdoor terraces. 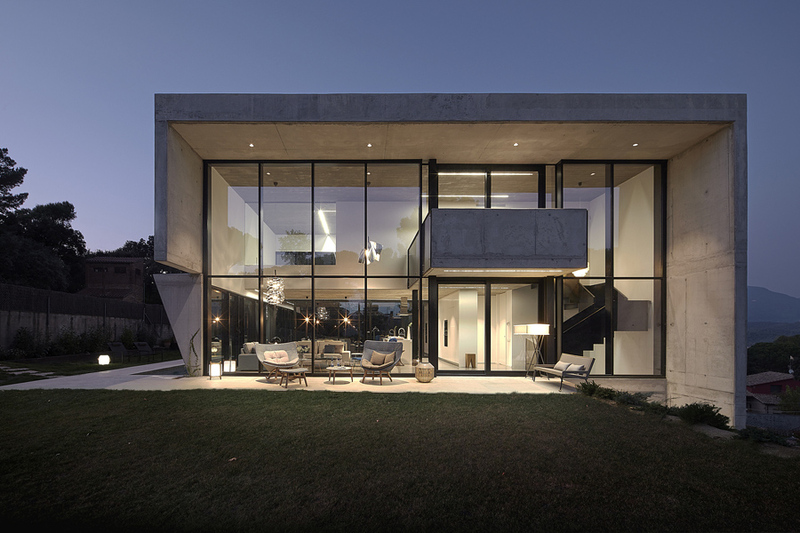 Large expanses of glazing break up the raw material giving the exterior a lightness. The walls of windows also afford views of the garden and the Montseny range in the distance. Aside from its great aesthetics, the home also has a functional side. Voltaic solar panels and an installation based on geothermal energy provide heat and energy for a near independent structure. If you want you can check other creative concrete houses: Modern Concrete Block House in Kuala Lumpur and Concrete Villa 131 By Bracket Design Studio.